This is an old Viva! favourite. We’ve simplified the recipe and broken it down into easy steps. Basically, while the main components are baking in the oven you do a bit of stovetop and blender action! The dish is lovely served with roast potatoes – white or sweet – or a grain such as rice or quinoa. 1 Pre-heat the oven to 200°C/400°F/Gas Mark 6. 2 Slice the two medium-large aubergines into large circular chunks to make 16 slices for the towers. They need to be approx 2-3cm/generous 1 inch deep. 3 Place 2 tbsp oil on one of the roasting trays and toss the aubergine slices on this then sprinkle with salt and set aside. 4 Now prep the sauce. Chop the sauce vegetables roughly, place on the second baking tray and toss them in the oil so that everything is well coated. Place in the oven along with the tray of aubergine slices. 5 Set the timer for 20-25 minutes. Check after 15 and turn the aubergine slices. 6 Meanwhile, make the filling. Peel and chop the aubergine and set aside. 7 In a saucepan, sauté the onion and garlic until soft, stirring so the garlic doesn’t catch. Add the spices. Reduce the heat a little and add a splash of hot water to the pan if it starts to catch. Add the chopped aubergine plus the sultanas or raisins, tahini, lemon zest, sundried tomatoes and coriander. 8 When the filling mixture is cooked and tender, add the cashews. Taste and add more salt if necessary. Keep warm. 9 Check the two roasting trays in the oven. 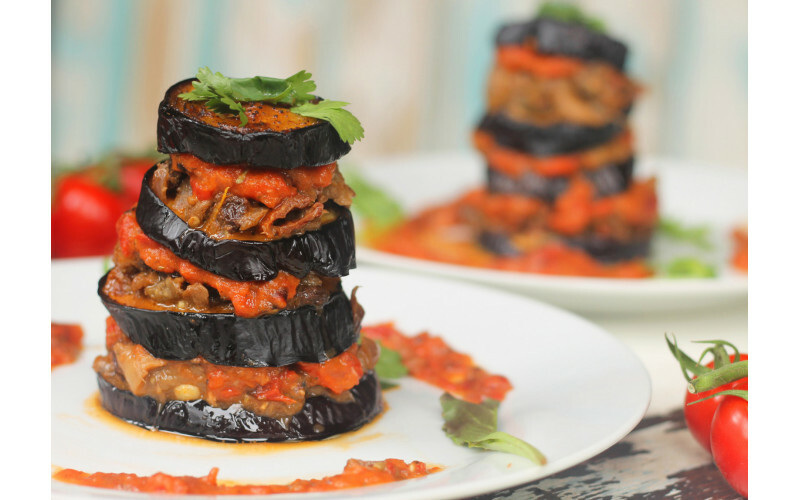 The aubergine slices should be tender and golden but not too soft. The roast vegetables should be softened and squidgy. Return either or both trays to the oven for another 5-10 minutes or so if necessary. 10 Make the sauce. Remove the sauce veg from the oven and blend until smooth. Taste and adjust seasoning if necessary. Reduce oven temperature by about half until the dish is ready to serve.